We prefer mares to run with our stallions for natural service wherever possible. It is the most efficient way of getting a mare in foal and less stressful for our stallions. 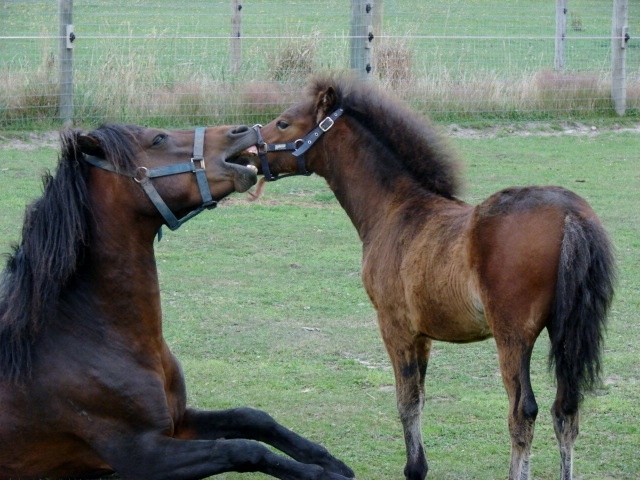 All our stallions are good with foals at foot. We will cover in hand if the mare owner prefers, or where assistance is required - for example some maiden mares need help to stand. We do not sedate mares. If they are not happy for us or our stallions to work with them reasonably safely they will be sent home. It is the mare owners responsibility to make sure that the mare is fit for service, i.e. in good physical condition, with no shoes and recently wormed. A pre service vet check and scan is highly recommended. You can do this at home or we are happy to do it for you - vet charges only apply. Machno Sportsman can cover cooperative mares up to 16hh by himself. Shilstone Dinger Tor up to 14hh. Dingmac Archie up to 13hh. Mares taller than this may still be covered in hand from a slope or covering ramp - Dinger is well trained at this and can cover up to 16.2 in this way, Mackie has managed 17hh. However it is much more dangerous for our stallions and handlers. The mare must be very quiet and still to stand. We may use breeding hobbles for this - the mare is able to walk freely and move away if she wishes but kicking is restrained. Our covering paddocks are mostly fenced with X-fence and breakable electric tape for mare and foal safety. All paddocks are supplied with mineral blocks. In the event of drought and insufficient grass the daily agistment fee will be reduced to $1 / day and the mare’s owner must provide their own supplementary hay / feed. Any other feed required to be provided by the mare owner and fed at cost. It is a great help if mare owners can provide any useful information about their mare - in particular dates on her season cycle, so it is worth observing closely for several weeks before coming to stud. 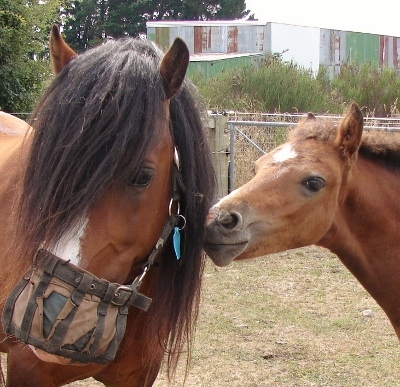 Mare owners will be asked to complete and sign a mare questionnaire and breeding contract, which is available to download at the bottom of this page. Please do read it thoroughly and ask questions if you are unclear on anything . We are happy to discuss whether your mare stays with us after service until scanning / waiting to see if she returns or goes home. Everyone has individual needs / preferences, but please remember, all fees due before your mare leaves our property! This schedule of fees may be subject to change. ​Fees and conditions as detailed in the breeding contract (below) take precedence.